BioWare's General Manager Aaryn Flynn took to the stage during EA's E3 2013 press conference today to show off a shiny new Dragon Age III: Inquisition trailer along with the announcement of a Fall 2014 release date. The footage is narrated by none other than Witch of the Wilds Morrigan and flips through a series of scenes that can only really convey a sense of disaster for Thedas. Flaming battlefields, a sorrowful Varric, a hulking Quanari, and a giant comet-spewing green rift in the sky. Yeah, Dragon Age III looks like it'll be a rough ride. Morrigan's parting words give the sense that you'll have a choice in how the world turns out though. 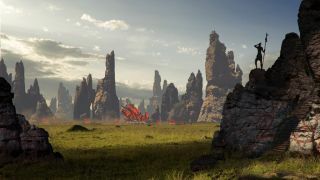 Details on importing your previous Grey Wardens remain scarce, but Dragon Age's creative director Mike Laidlaw has tweeted that they have a plan in place. After checking out the trailer, look and see if it matches up with what we want to see from Dragon Age 3. For the latest from E3, check out our complete coverage .